Chajangbop is a delicious rice dish spun off from chajangmyun where black bean paste is mixed in with white steamed rice, bop, instead of noodles. 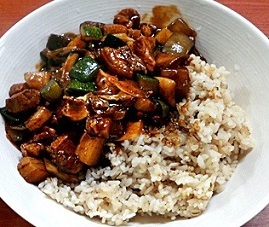 Chajang is the sauce made from black bean paste which gives its distinctive black color and its sauce mixture containing chopped onions, potatoes, carrots, meat and seafood, usually squid, shrimp, and sea cucumber. Some starch is added to give it a thick consistency and it is served over rice. It's a popular rice dish usually served at Chinese/Korean restaurants but you can also order a side takeout of chanjang to be enjoyed at home. Instant packages of chajang mix are also readily available at Korean supermarkets make chajangbop. Common side dish usually found alongside chajang bop is donmoogee which is pickled daikon radish.